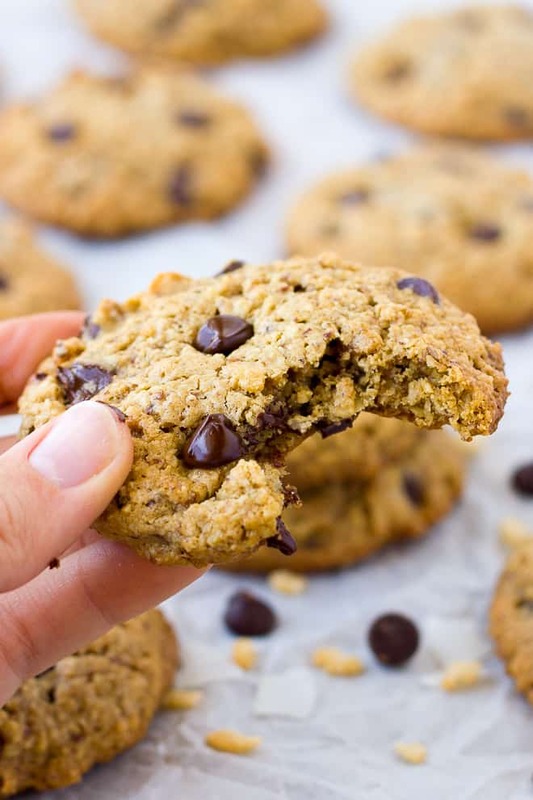 These gluten-free cowboy cookies are hands down the best cookies I’ve made all year! They are crispy on the outside, soft on the inside and like any good cowboy cookie, are loaded with lots of yummy mix-ins! My husband’s Grandma made “Ranger Cookies” for him all the time growing up. Amongst the usual oats and chocolate chips in ranger/cowboy cookies, her secret ingredient was crispy rice cereal. 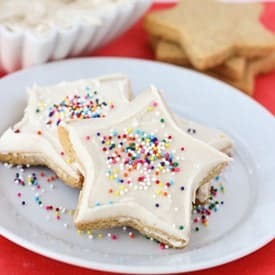 This gives the cookies a little extra crunch and texture. The first time I had a ranger cookie, I was in love! I added some gluten-free crispy brown rice cereal to these and it worked perfectly. 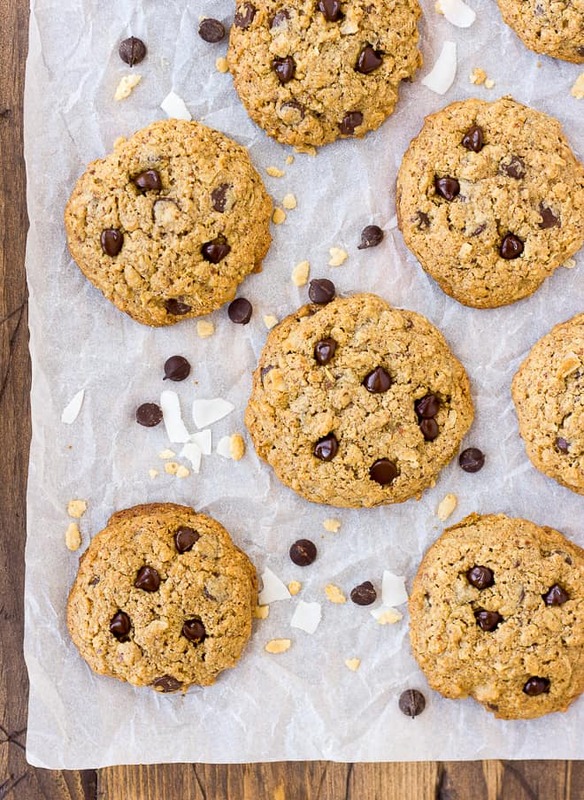 You would never guess these cookies are gluten-free. 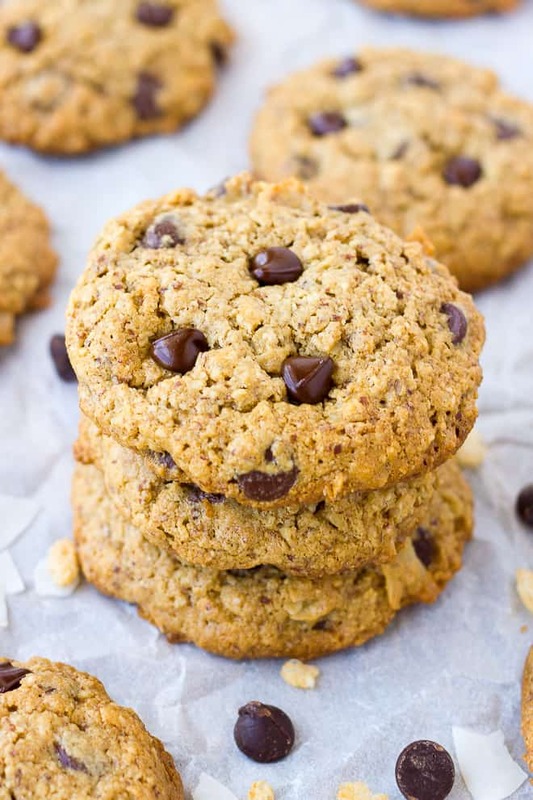 They are made from a combination of oat and almond flour. Two of my favorite gluten-free ingredients! I toast the oats and grind half of them into a flour in the blender for the cookie dough. The rest of the oats are added in whole along with coconut flakes, chocolate chips, and the crispy brown rice cereal. You can easily customize this recipe to your tastes. You could add white chocolate chips or butterscotch chips to play around with the flavors. Any chocolate would be divine in these! You could also add nuts in place of or addition to the coconut flakes. 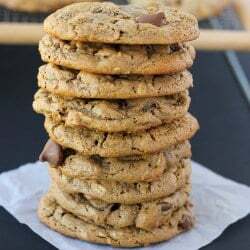 It ‘s been far too long since I posted a cookie recipe. So these are a happy site! My husband and I quit sugar completely for a month. We are continuing to only eat sugar and treats on the weekend or special occasions. 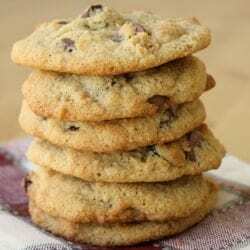 This weekend seemed like a good time to try a new cookie recipe! Because would a life completely without cookies be worth living? Not in my book! Preheat the oven to 375F. Place the oats on a rimmed baking sheet. Bake the oats for 10 minutes, until toasted and golden, stirring once halfway through. Measure out 1 cup of the oats and place in a blender or food processor. Process into a fine flour, place in a bowl. Add the baking soda, salt, and almond flour to the oat flour and stir to combine. Set aside. In the bowl of a stand mixer, cream together the butter, coconut oil, white sugar, and brown sugar. Add the vanilla and eggs, mix on high until light and fluffy, 2-3 minutes. Add the flour mixture 1 cup at a time, beating well after each addition. Stir in the remaining 3/4 cup toasted oats, crispy brown rice cereal, chocolate chips, and coconut flakes until well combined. Refridgerate the dough for at least 30 minutes and up to overnight. Line 2 baking sheets with parchment paper. Form the dough into tablespoon rounds and place on the lined baking sheet about 3 inches apart. Bake for 12-14 minutes, or until golden brown around edges. Cool and enjoy! *Though it isn’t necessary, you can add 1/2 teaspoon xanthan gum to these if you like. The cookies will hold together a little better after they cool. I don’t see when to add in the 1/4 cup white sugar. In which step should it be added? Whoops! You add it in with the brown sugar. I’ve updated the recipe. Thanks for catching that! Thanks very much for the speedy reply…I have them chilling in the fridge right now! Yay! I hope they worked out for you! These look great!! My daughter has a dairy allergy…I’m thinking if I use all coconut oil they may spread too much. Hmmmm. I don’t love using palm shortening as much as I do coconut oil but perhaps that may be the ticket…? Or I may use a scant 3/4 cup coconut oil. Anyway…thank you, thank you…these look fun!! Hi Angie! You could definitely try it. I think it might work will all coconut oil if you refrigerate it a little longer, maybe an hour. Earth Balance Buttery Sticks would also work in place of the butter. I hope you like them! Hi Kelli! Yes you bake them at 375 F. I hope they turn out for you! Yay thanks for reporting back! I’m so glad they worked out for you! Can I leave out the,crispy rice? 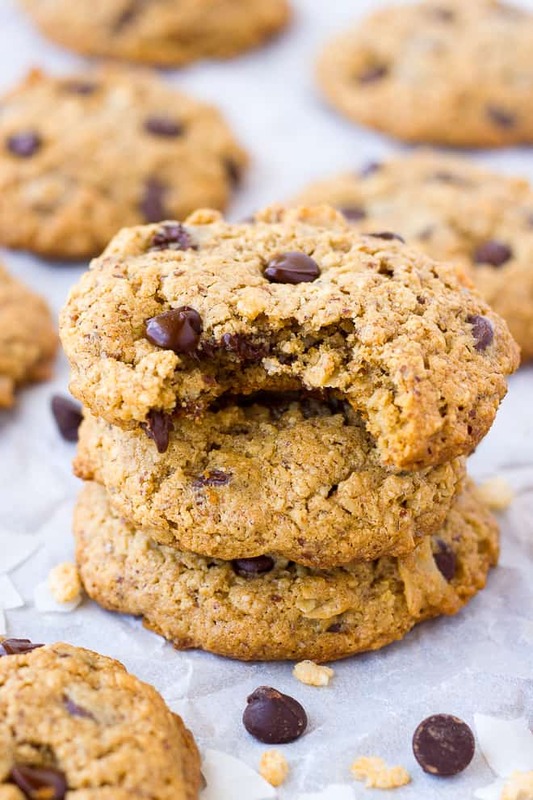 Can these cookies be made without coconut oil and a more heart friendly oil? Thanks! Thanks for the recipe. I like the cookies although I’d add about 1/4-1/2 cup more brown sugar next time. They aren’t sweet at all. The only change I made was to replace the crispy brown rice with 3/4 cup chopped toasted pecans. Also: I was surprised the cookies didn’t spread out more since you advised to space 3” apart. Mine didn’t spread at all. Instead of cookies, these remind me of little round chunky bread lumps. Good with hot tea. How many servings per recipe. I am trying to figure out calories per cookie.